I remember when Google Maps first came out. It was pretty amazing for the time. You just dragged the screen with your mouse and content around it filled in! It seems pedestrian now but at the time it was mind blowing in its usefulness and simplicity. This is a great way to kill time. It turns out though that the more time you spend just surfing this sort of Google Maps of the sky the more you learn about our aviation system. 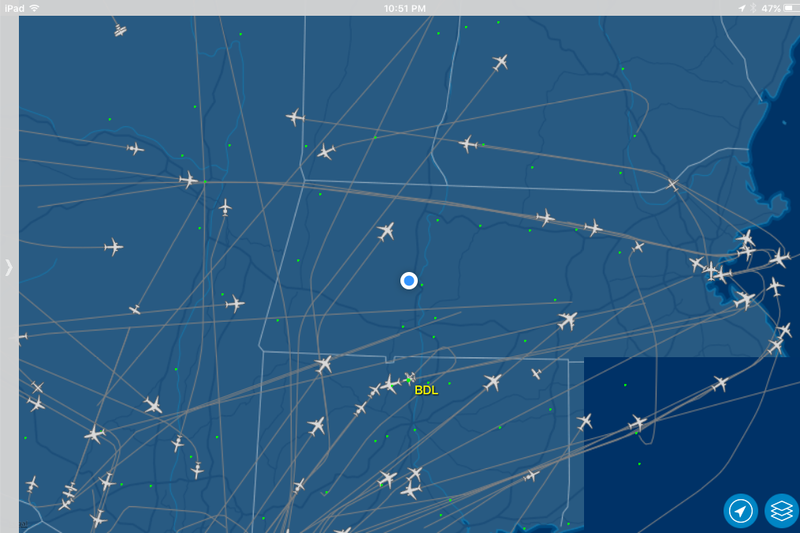 It’s neat and scary and more than a little awesome to see how congested our skies actually are. And doubtless there are flights that don’t appear on the app, although sometimes the app will surprise me. I live in Northampton, Massachusetts. We have a small little airport not big enough for even a Lear jet. But sometimes even a private pilot in a two-seat biplane just buzzing around the Holyoke range shows up. Last night I was looking at Sydney, Australia. Amidst all the regular jet traffic, it was also tracking a helicopter flight, obvious from both the helicopter icon and its weird flight pattern. 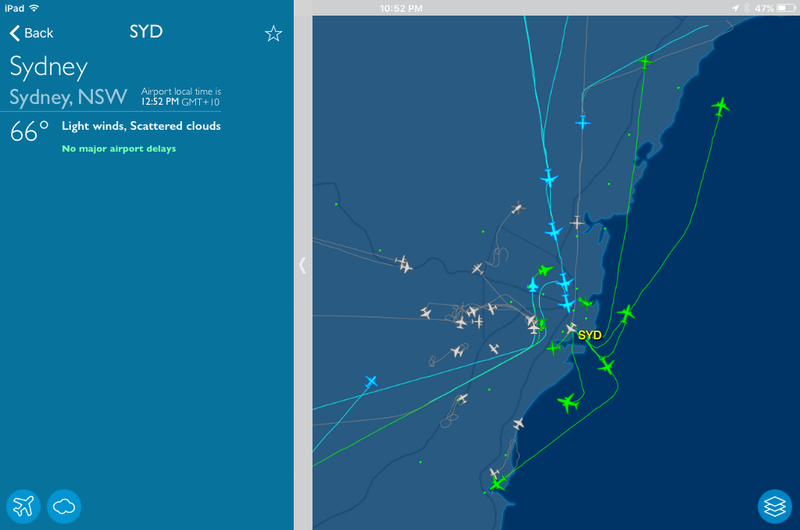 Air traffic near Sydney. Can you find the helicopter? To get this level of insight half a world away in near real time is fascinating. Doubtless there is a huge infrastructure of networked servers behind all this magic that FlightAware is tapping into. I just didn’t expect it to be global in scope. I can see Air China flights from Beijing to Moscow. I watch Aeroflot flights between cities in Russia I’ve never heard of. I see some crazy flight paths, like one from New York to Delhi that works goes way out of its way to avoid dangerous airspaces. There is a huge amount of international air traffic, even here in the United States. Much of it goes over my head, although I am largely unaware of it. Naturally JFK and Newark send lots of planes out to Europe and Asia, but so do Philadelphia, Atlanta, Washington and much of it flies over my head. 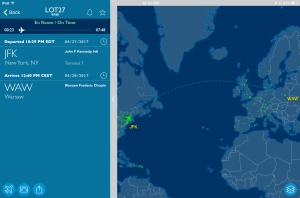 The outbound flights unsurprisingly are mostly in the evening. Inbound flights tend to arrive in the middle of the afternoon. Essentially there is a huge air train of passenger and cargo flights arching out to the north-northeast in the evenings, mostly passing over Newfoundland but sometimes Labrador. There are some amazingly long flights. I stumbled on one of the longest: Los Angeles to Jeddah with a total flight time of nearly seventeen hours. It’s pretty easy to guess the international flights. The icons on the screen show large airplanes and they tend to move north-northeast in the evenings. At the same time it’s amazing how quickly jets actually move us. Mexico City is less than four hours flight time from most of the United States. You can fly between pretty much any two points of the continental United States in five hours or less. At night you see a lot of cargo jets going to Memphis, where Fedex has a transfer point. A lot are also going to Covington, Kentucky too, which is basically Cincinnati. I believe it is a UPS hub. And many of these are long haul cargo flights from Europe and Asia. The United States gets a lot of serious weather. It’s obvious comparing the USA to other countries with all the storms I see, mostly in the south and Midwest. Sometimes flights will go out of their way to avoid these storms. In Europe I rarely see weather like this. Airspace can get pretty congested. 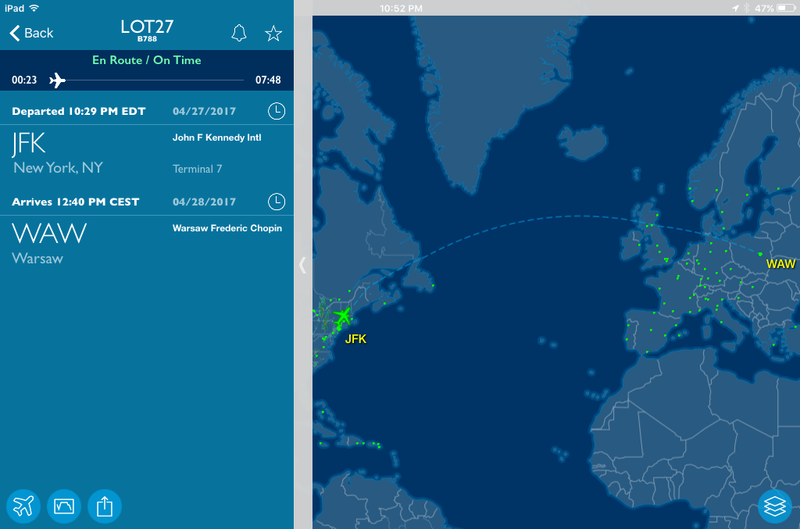 It’s amazing that they can manage the chaos of all the planes descending and taking off, particularly around New York. 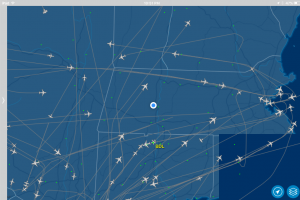 Watching Atlanta’s airspace is fascinating because two runways get most of the traffic and jets tend to line up neatly behind one another to land in a sort of delicate ballet. The size of the airplane icon is indicative of the size of the jet, making it easy to spot the larger airplanes in flight. It stores about a week of flight history. After my recent flight back from Europe I was able to find it in the history and trace our flight path over Labrador. In general I find it just fascinating. The vast size and scope of our aviation system is rendered apparent in the app, along with its constantly fluid nature. No wonder I have a hard time putting it down!